In 1964, Warren Winiarski left the University of Chicago for a life in the vineyard, settling in the Napa Valley. To learn the business he worked for veteran winemakers like Lee Stewart and Robert Mondavi, and attended extension courses taught by researchers at UC Davis. In 1969 he bought about thirty-five acres of farmland, which he planted to Cabernet Sauvignon grapes. The wine he made from his second crop, harvested in 1973, placed first in the 1976 Paris tasting. The Winiarski family arriving in San Francisco before heading across the bridge toward wine country. 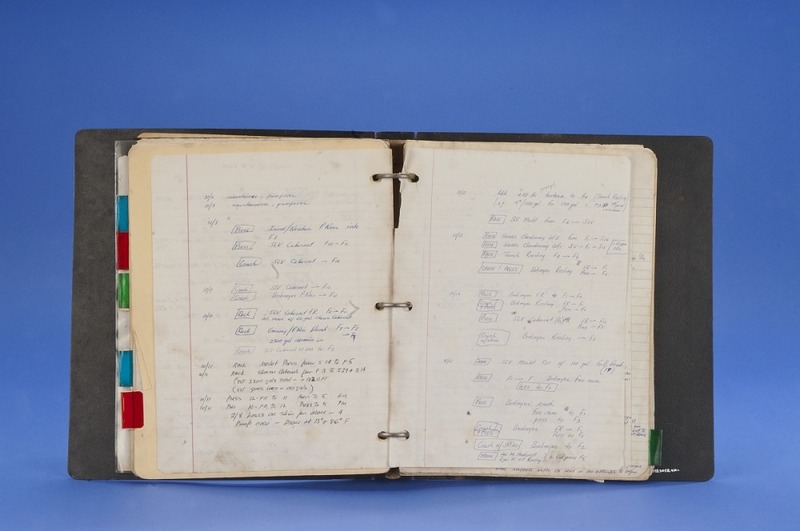 Winiarski’s notebook contains notes on early operations at Stag’s Leap Wine Cellars. Gift of Warren and Barbara Winiarski. In 1997, a team of Smithsonian researchers conducted an oral history and collecting project with Warren Winiarski and the staff at Stag’s Leap Wine Cellars in Napa, California. The team recorded the words and activities of people working in the vineyards, cellar, and winery. These 15 short video segments provide a closer view of the knowledge, tools, and skills that go into making wine at a small, modern California winery.